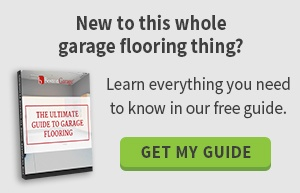 When you think about your garage, you probably do not put much thought into the flooring. After all, that ubiquitous cement floor is the “gold standard” isn’t it? Actually, that does not have to be the case. Many options in flooring for a garage go far beyond the same old cement. Choosing a different option for your floor can be a strictly practical choice. However, there is no reason not to consider something just for its attractiveness too. Check out these five options and find one that will meet your needs. Granite Gray – This is one of the decorative chip floor options available at bostongarage.com. It offers the look of a high-end granite but in a floor covering that is durable enough to stand up to heavy use. This is an excellent touch for those who love the look of granite throughout the house. Camo Green – If camouflage is your favorite color, why not bring that look into your garage as well. What better option for a garage designed as a man cave than a camo green? This is also one of the decorative chip flooring options, so you can rest assured that it is designed to stand up to heavy traffic and even resist spills. Epoxy Concrete Flooring – If a solid color is more your speed, consider one of the epoxy concrete flooring options available at Boston Garage. These solid coatings have a high gloss shine and will withstand even the heaviest use. Plus, they are available in many different colors so it is easy to match your planned decorating scheme. 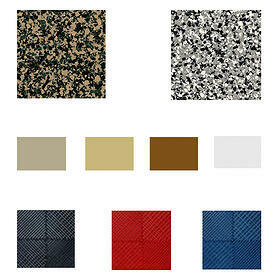 Garage Floor Tiles – Another option is the Trax garage tile system. These are colorful, durable and easy to maintain. Since it is a tiling system, you have the ultimate in flexibility and they can be used indoors or outdoors. Commercial Garage Floor Coating – A final option is a commercial grade floor coating. This has an added durability factor that makes it ideal for professional garages, shops or anywhere there is especially heavy traffic. Making this choice virtually assures that you will have beautiful and functional floors for years to come. As you can see, the options for garage flooring extends far beyond that boring, gray cement that most people have. By choosing something a little more attractive, you can improve the appearance of your floor and possibly even add value to your home.